Exercise is vital for healthy aging and fitness. Whether you are generally healthy or are coping with an ongoing disability or health problem, regular exercise will help you stay healthier, more active, and improve your outlook. There is plenty of material to read for tips on getting started and weaving exercise into your daily life, making it enjoyable instead of a chore .Seniors who engage in a regular exercise program have better fitness and health than those who do not. Regular activity can reduce blood pressure and lower the risks of heart attack & stroke. Many seniors don't exercise for the same reason that people of all ages resist physical activity – they think of it as too hard, too boring, or they are disappointed by the lack of immediate results. On top of this, some older adults have additional challenges, such as chronic health conditions or concerns about injury or falls. A routine fitness program can also minimize stress and the inability to have a good night's sleep. Many seniors, who participate in a fitness program, find they sleep better. Many of these age related health inconveniences are indicative to seniors. Participating in a fitness program can reduce pain, medication and doctor's visits. Seniors need to consider creating a fitness plan that will be easy of joints, but still strengthen their over-all body. Walking and bike riding are excellent choices for seniors with arthritis. Exercise benefits people of all ages. In fact, studies show that not only is exercise safe for seniors, but it has enormous health advantages. Exercise can help you maintain your health and independence throughout your life. Regular exercise and senior fitness is the key to greater energy, stronger muscles, better balance and flexibility, and a happy and alert mind. 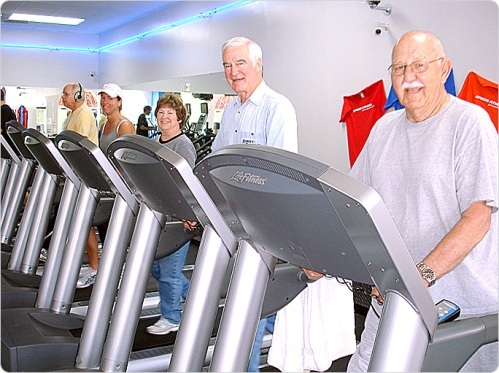 Contact us today to learn more about our senior fitness programs.